Located in Dubai’s Al Qouz industrial area, Alserkal Avenue was founded in 2007 with the aim of promoting cultural initiatives in the region. 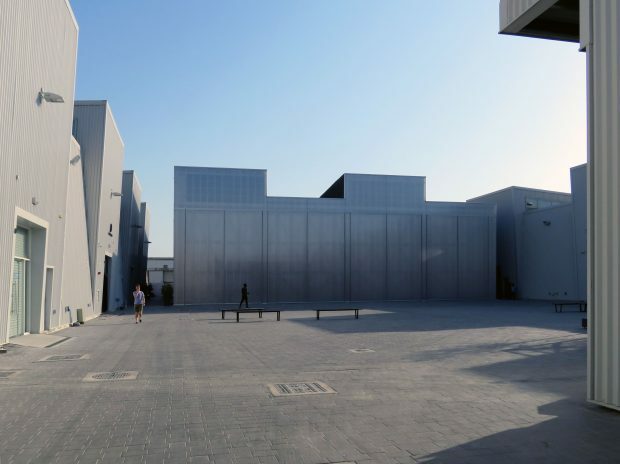 Since then, it has become Dubai’s most important art hub with twenty-five galleries and art spaces. Concrete, a new venue, addresses the districts growing need for a centrally located public space which can host a diverse program. The 1,250 m2 former warehouse provides a multi-purpose venue to accommodate a series of public events, including exhibitions, performances, lectures, and fashion shows. The planning strategy focused on maximizing the event area. All the services were consolidated on one end of the building, allowing the entrance and event spaces to be situated closer to The Yard, the district’s main outdoor public square. The design for the interior introduces a flexible floor plan to accommodate the required program diversity. Four 8.10 m pivoting and sliding walls can create multiple space configurations depending on the type of event. To maintain a fluid space, all the major interior equipment has been integrated into the ceiling, leaving the walls and floors free of any components. Two linear skylights have been positioned above the movable walls to allow either thin blades of light or full daylight depending on the configuration. The original front façade of the ware-house has been replaced with poly-carbonate cladding and full height operable doors. When the doors are open, the exterior and interior space can merge, activating the courtyard. The connection to the exterior is reinforced by the translucent poly-carbonate, which brings the view, daylight and outdoor activities into the interior space.